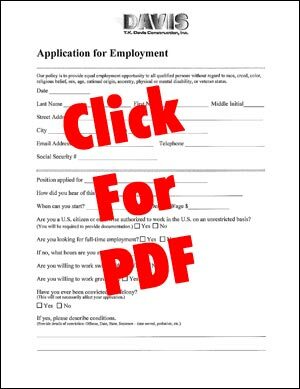 Please click on the form to the right to print out our PDF Employment Application. T. K. Davis is always accepting applications. Fast growing construction company seeking organized and responsible individuals to oversee and manage General Commercial Construction projects. Must be able to travel throughout the Commonwealth of Virginia. Valid Driver’s License required. The successful applicant will be a highly motivated and organized team player, and will possess excellent communication skills. Experience in proper project sequencing, quality control and safety management is required. OSHA and CPR Certifications required. A working knowledge of Microsoft Project is a plus. Salary commensurate with experience, negotiable. Benefits available. T.K. Davis Construction is searching for a qualified Assistant Superintendents to help manage commercial construction jobs in Central Virginia. Candidates must possess a minimum five (5) years of experience. The ability to read commercial project blue prints is required. Excellent communication skills and a working knowledge of Microsoft Outlook, Excel, and Word are also required. A working knowledge of Microsoft Project is a plus. The successful applicant will be a highly motivated and organized team player, and will possess excellent communication skills. Experience in proper project sequencing, quality control and safety management is required. Salary commensurate with experience, negotiable. Benefits available. OSHA and CPR Certifications required within 60 days of employment. T.K. Davis Construction is searching for Project Managers/Engineers capable of producing daily job progress reports, meeting minutes, requests for information, and submittals. High School Diploma or GED is required. Some college is preferred. One to Two years of experience or an equivalent combination of education and experience is required. Excellent communication skills and a working knowledge of Microsoft Word, Excel, and Project are required. The ability to read architectural drawings is required, and experience with Bluebeam software is a plus. The successful candidate will possess the ability to Prioritize, Multi-task, work well under pressure, meet deadlines, and self-manage. Attention to detail is a must. Salary commensurate with experience, negotiable. Benefits available. OSHA and CPR Certifications required within 60 days of employment.